Existing conditions. Store set-back from the street with surface parking on site, and angle parking on 73 Street. For the past 56 years, South Miamians have appreciated the presence and convenience of the Winn Dixie store located at 5850 SW 73 Street. Since 1962, the Winn-Dixie grocery store has proudly been serving the local supermarket needs of the South Miami community. Winn-Dixie is a well-known and well-respected brand with deep heritages, strong neighborhood ties, proud histories of giving back, talented and loyal associates, and strong commitments to providing the best possible quality and value to customers. In 2013, the Winn-Dixie brand was acquired by Southeastern Grocers, LLC which has multiple brands (Bi-Lo, Harveys, and Fresco y Más) and serves communities in Alabama, Georgia, Louisiana, Mississippi, North Carolina, South Carolina, and Florida. Southeastern Grocers, headquartered in Jacksonville, was rated #31 in Forbes 2015 ranking on America’s Largest Private Companies. In 2015, Southeastern Grocers invested mightily in the South Miami store in bringing modernizing and expanded offerings and celebrating its new look during its “Grand Reveal” reception on Thursday, July 9. Its CEO/President Ian McLeod was joined by local government, civic and business leaders for the special ribbon cutting ceremony. Customers have enjoyed a refreshed shopping experience, boasting upgraded and expanded seafood, deli, bakery, produce and wine department (see somimag.com archives Aug/Sept 2015). According to the Miami-Dade County property appraisers office, the parcel of land of 65,830 sq.ft. was acquired in July 2007 for $14,500,000. Facundo Bacardi, who frequents SOMI with his family. acquired the property at that time. Discussions were had with city leaders over the past few years as to the redevelopment of the property. Some thought was given to a boutique hotel or other uses, but serious concern was given to maintaining a grocery store in the area. Representatives of the owner scoured the area in search of a suitable location for a grocery store, should the site be otherwise developed. Architect’s rendering showing the proposed new development with lot line built out to the street. Engaged to develop the plans is architect Kobi Karp, whose internationally recognized architecture and interior design firm, providing unique, creative and innovative design solutions to renowned clients internationally and domestically in hospitality, retail and high-rise residential developments. The developer is looking at a financial layout of some $100 million. 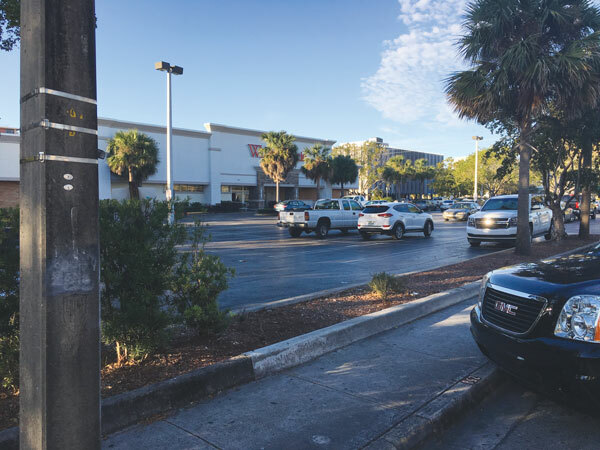 The redevelopment would include an expanded Winn-Dixie store to 40,000 sq.ft., from its existing 19,216 adj.sq.ft., below street level parking for 150 vehicles, 15,000 sq.ft. 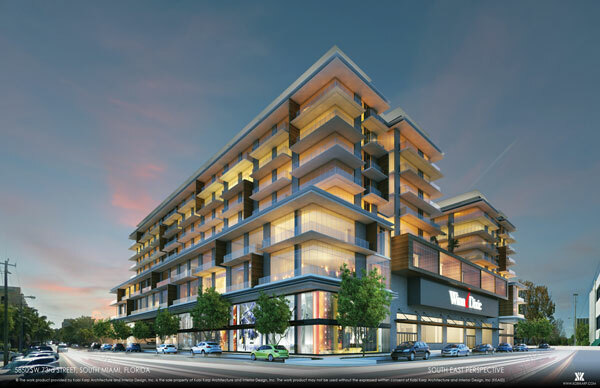 of retail and 2 eight-story upscale residential units of one, two and three bedrooms. The challenge of the site is the water table is 14’ below. Subterranean parking is extremely expensive; the developer estimates $12-18 million to subsidize Winn Dixie build-out and the lower level parking. Streetscape improvements with wider sidewalks and removing angular parking on the street will enhance the project’s presence on 73rd Street. The new Winn-Dixie store will be modelled after its new model as seen in its Baymeadows store in Jacksonville (February, 2016) and provide a contemporary, friendly and exciting in-store environment. By City Charter the vote for approval by the elected City Commission must be a unanimous 5/5 vote. It is anticipated that the project will be up for review within these next three months. SOMI Magazine will continue to provide updates on this project in subsequent issues.